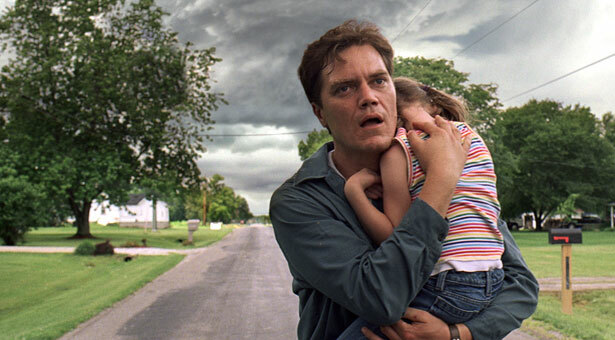 A vision of pending doom drives Curtis (Michael Shannon) to seek shelter for his family in Take Shelter. Photo by Grove Hill Productions, courtesy of Sony Pictures Classics. "You can't stop what's comin'." This fatalistic prophecy was delivered to a troubled Texas sheriff in No Country for Old Men, the film that won the Academy Award for Best Picture in 2007. In the Coen Brothers' celebrated adaptation of Cormac McCarthy's novel, a rising tide of evil in the world rendered the Western myth of the gunslinging hero useless. Darkness had become unstoppable. Hope could be found only in dreams, in the notion of a mysterious consolation beyond this doomed dimension. A few years and several apocalyptic movies later, a movie called 2012 arrived: A tsunami of special effects enabling a tsunami of natural disasters that plunged the world into chaos. It's 2012. And if we haven't seen the world's end out our windows, we're seeing it all the time at the movies. The big screen might as well be graffiti on a subway wall: "The End Is Near." We've endured a Contagion from Steven Soderbergh, in which the world is rapidly depopulated by a seemingly unstoppable airborne virus. We were assailed by super-monkeys created by our own scientific irresponsibility, in Rise of the Planet of the Apes. Stories about zombies, vampires, and alien invasions (e.g., Cowboys and Aliens, The Walking Dead, and Attack the Block) are everywhere. Does our obsession with these monsters relate to our fear of potential contagions, or our feelings about this election year's options? Perhaps the answer is "all of the above." Whatever the case, these common cries of "Doom!" come with a variety of perspectives about whether we should welcome the end or resist it. Lars Von Trier's new film Melancholia, which won Kirsten Dunst a Best Actress award at the 2011 Cannes Film Festival, depicts planet Earth on a collision course with another planet that has flown out of orbit. As the end gets closer, a lavish wedding celebration is tainted by a bride's despair and irresponsible behavior. Or, more accurately, the wedding celebration is a travesty because everybody is misbehaving, betraying one another, and demonstrating cruelty. When the countdown to annihilation comes down to the final seconds, it's clear that the only sane person on earth is the one who is ready to embrace the end. For Von Trier, it appears that the end cannot be nigh enough. In this season of big screen nightmares, Take Shelter is an interesting case. American director Jeff Nichols tells the story of Curtis LaForche, a man (Michael Shannon, perfectly cast) who sees visions of apocalyptic storms on the Ohio horizon. Sometimes, the storm brings huge flocks of birds, sometimes motor oil falls from the sky. He's not sure if he's sliding into dementia, or if he's being given a prophetic vision. And he can't decide how to respond either. A typical Western male, he rejects the offers of help from his large-hearted wife (Jessica Chastain), spends money his family set aside for their daughter's medical treatment, and determines to prepare for the world's end with his own strength and resources. It's easy to take this journey as a thrill ride. Curtis' visions careen from storms of birds straight out of Hitchcock to surreal gravity disruptions and frightful attacks that seem like something out of The Walking Dead or The Shining. But the film has much bigger issues on its mind. It's asking us questions about our individual and cultural premonitions of the end. Are we becoming paranoid? If so, why? Is it because of the news? Is it repressed guilt finally rising up to convict us? It's also asking us about how we respond to warnings that, in ages past, would have been worth taking seriously. Have we, in the age of "enlightenment," decided that prophets are merely madmen? Do we have the attention spans anymore to heed the signs? And even if we do pay attention, and see the frightful signs of the times, how should we respond? Curtis determines to save his family with his own two hands. He sets up a storm shelter in the backyard without care for his wife's valid concerns. Is he a hero or a fool? When he starts shouting like a crazy person at the neighbors, is that the only sane thing for a culture that isn't listening? These apocalyptic visions lead to a sort of self-generating apocalypse within Curtis's family and community. He becomes a storm in an effort to prepare for one. Nevertheless, even as the film asks us to challenge Curtis's behavior, Nichols' script wisely refuses to dismiss the possibility that an apocalypse might indeed be coming. And the film concludes in a place of admirable balance, conveying the urgency of vigilance, the importance of grace-filled cooperation, and the need to resist the power of fear, which can render us that much more vulnerable to the storm … if the storm comes. Why Now? And How Shall We Respond? The rise of apocalypse movies might be connected to the amount of information we absorb every day, with our nonstop streaming of bad-news headlines. Why shouldn't we feel a growing sense of insufficiency and unpreparedness in the midst of such dire tidings? As the book of Ecclesiastes cautions us: "In much wisdom is much vexation, and those who increase knowledge increase sorrow." Almost every day reminds us that we're feeble when we face the power of nature: Just look at how America managed the wrath of Hurricane Katrina. Other headlines emphasize the dispiriting reality of human evil: For all of the times we said "Never again" after the Holocaust (or after seeing Schindler's List), we now see so much graphic footage that tells us it is happening again — senseless cruelty, atrocities, genocides, right now in neighboring countries — we begin to feel helpless to stop it. At our worst, we behave as though the problem is in Somebody Else, and so we depict that person as a villain and tell stories about how we can vanquish them. But the Cold War is over, so Russians are no longer available as popular villains. And it's become unacceptable (rightly so) to tolerate stereotypes of Middle Eastern characters as terrorists and villains. So, in our compulsion to indulge our fearful, violent impulses, we lash out at zombies! Vampires! Aliens! Contagion! At our best, we are reminded that we're broken people, unable to save ourselves. Some films are daring enough to suggest that the problem exists within the heart of every human being. (The celebrated film Of Gods and Men asks us to refrain from demonizing even those who plot our destruction, since all of us are complicit in the world's corruption.) That is, I think, a healthy step, evidence of a growing honesty and humility. Near the conclusion of Terrence Malick's The Tree of Life, we see the earth being drawn into the furnace of the sun. It's the end of time. And yet, this moviegoer found the vision encouraging, even inspiring. Malick's film depicts, in what is arguably more astonishing imagery than any of these other films, that what happens in the world of the human heart also happens in the cosmos, and the struggle between light and darkness is graphically displayed on both scales. And yet, through it all, there is a persuasive sense of hope and grace. The presence of beauty is, itself, a counterargument. Beauty offers evidence of divine purposes beyond our own imagination. And you can make a fair argument that, of all of these films, The Tree of Life is the one that's most true to life. But in that film, we are not the only hope. And the end of time is not the end of the story. We "can't stop what's comin'" … but beauty may yet save the world. Which end of the world do you prefer? What apocalyptic films do you recommend? Posted Saturday, December 28, 2013, at 8 p.m.